Water fountains are frequently used in feng shui to bring beneficial energy into homes, rooms, or other spaces. 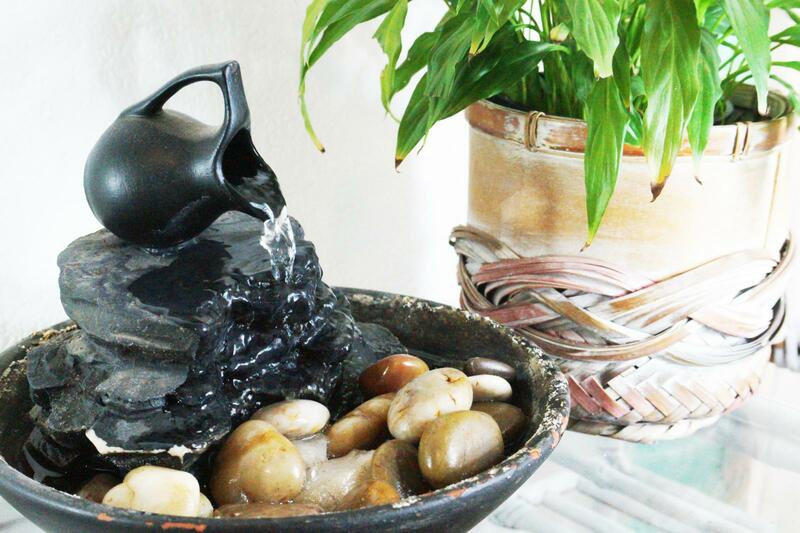 Appropriate water fountain placement ensures auspicious feng shui, so following a few rules and guidelines can help you to make the most of them. Water fountains represent the element of water and therefore follow the same placement rules as other water elements. You can place a fountain inside or out your front door. The movement of the water in the fountain also encourages and supports flow of chi. However, the direction the water flows is important in facilitating energy flow. When placed outside your front door, make sure the water in the fountain flows towards the door, not away from it. The direction of the water flow determines the direction of the energy, and you want to bring the energy into your home, not push it away. When placing a fountain inside your front door, place it so the water is flowing in towards your house interior and not out towards the door or you may push the energy right back out the front door. Place fountains in the family (eastern) sector of a space, which is governed by the wood element. Water nourishes and strengthens wood, and placing a fountain here helps to nourish family relationships. Placing a fountain in the northern sector will help support your work and career. This aspect of your life and sector is governed by the element of water. Located in the southeast, your abundance, luck, and wealth sector are governed by the element of wood, so the water element of a fountain feeds this. You can further reinforce the energy of abundance by placing a few coins in the fountain. Since your office is the source of your career and the place where you carry out your work, placing a fountain here is auspicious. Follow other materials and placement guidelines to ensure you select the right type of fountain and place it correctly to support your career aspirations. Fountains usually aren't a great idea in the marital bedroom because they represent the water element, and water can douse the fire that fuels marital passion. The bathroom tends to be a pretty watery place because of all of the running water, bathing, and other activities that occur there. Therefore, placing a fountain may create an overabundance of water energy. The south sector, which supports fame and recognition of achievements, is not an auspicious location for a fountain. This is because it is governed by the element of fire, and water douses fire. Placing a fountain under a staircase is considered inauspicious. It may have negative effects on health or children who spend time in the space. 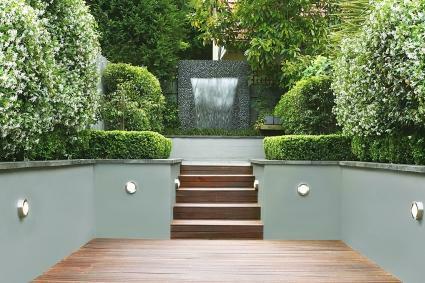 Consult the bagua to map your garden or outdoor space for optimal feng shui water fountain placement outside. Place it in the appropriate sectors (east, north, and southeast) for the most auspicious energy. Always have outdoor water features flowing towards the house to bring the auspicious energy to you instead of away from you. Water fountains support the water element in feng shui. However, the materials the fountain is made of will also represent an element. For example, a metal water fountain will also support the element of metal, while a ceramic or stone water fountain will support the earth element. Therefore, when considering which materials you'll select for the fountain, think about their intended purpose and whether you'll want the fountain to support or balance out other elements. 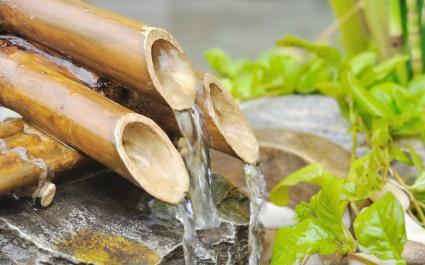 A wood fountain, such as one made of bamboo, supports the element of fire and reduces the element of earth. Auspicious placement for a wood fountain include in the eastern sector of a space to support family and strengthen health or in the southeast sector to support prosperity and abundance. If you feel you have too much earth energy, you can place a wooden fountain in the southwest corner of a space to temper the wood energy. A metal fountain, such as a copper fountain, strengthens the element of water and reduces the element of wood. Auspicious placement for metal fountains include in the northwest sector of the space to attract benefactors, or in the western sector to benefit creativity. Metal diminishes wood, so if you feel wood energy is too strong, place a metal fountain in the eastern or southeastern sectors to create more balance. Fountains made of stone, clay, or similar materials represent the earth element, which strengthen and support the metal element and diminish the water element. Auspicious placement for a fountain with these materials is the southwest sector to strengthen love and family, as well as the northwest and western sectors. If you have too much water energy, a fountain made from earth elements cancels it out and becomes more neutral because a single element contains both water and earth. Glass is a reflection of the water element, so if you have a fountain made of glass it strengthens the water element even more. Therefore, the most auspicious placement for a glass fountain is in an area that requires a great deal of water energy, such as the north sector, which governs career. Does Your Feng Shui Fountain Style Matter? The style of the fountain doesn't matter nearly as much as placement and materials. Choose a style that appeals to you and fits within your decor, considering other aspects such as how colors and symbols enhance the energy you are trying to support. When placed appropriately, feng shui fountains can bring auspicious energy into the spaces you live, work, and play and enhance your life and well-being. Start simply with a single fountain and place it carefully. Always keep the fountain well maintained and in working order to bring the energy of moving water into your life.